Vibrio cholerae O1, the causative agent of the disease cholera, has two biotypes namely the classical and El Tor. Biotype is a subspecific taxonomic classification of V. cholerae O1. 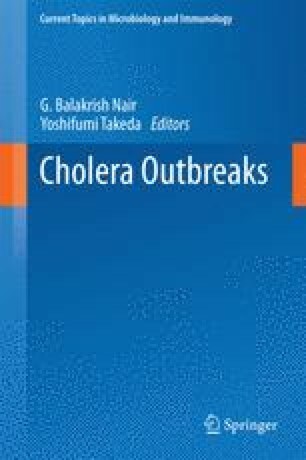 Differentiation of V. cholerae strains into biotype does not alter the clinical management of cholera but is of immense public health and epidemiological importance in identifying the source and spread of infection, particularly when V. cholerae is first isolated in a country or geographic area. From recorded history, till date, the world has experienced seven pandemics of cholera. Among these, the first six pandemics are believed to have been caused by the classical biotype whereas the ongoing seventh pandemic is caused by the El Tor biotype. In recent years, new pathogenic variants of V. cholerae have emerged and spread throughout many Asian and African countries with corresponding cryptic changes in the epidemiology of cholera. In this chapter, we describe the outbreaks during the seventh pandemic El Tor biotype era spanning more than five decades along with the recent advances in our understanding of the development, evolution, spread, and impact of the new variants of El Tor strains.